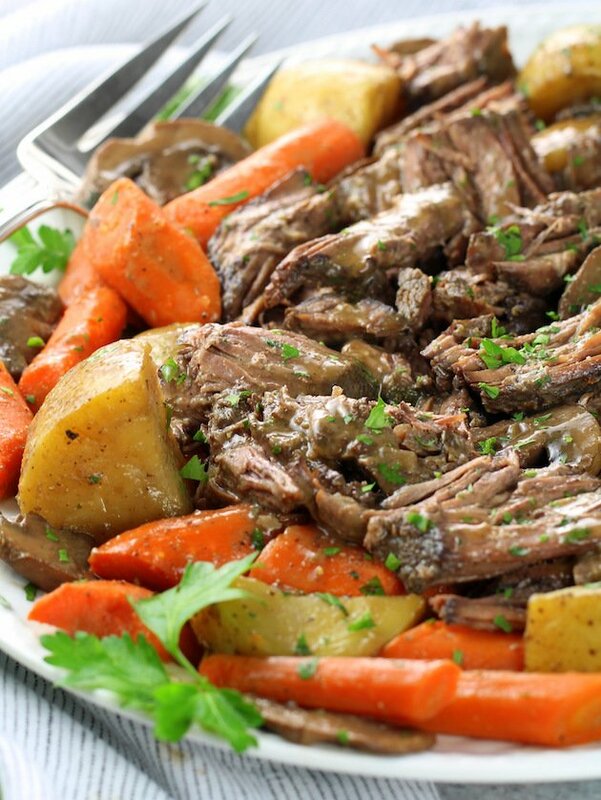 This Instant Pot Pot Roast is everything that a tender, hearty, pot roast should be… and more! The beef roast is tender and juicy, the veggies are cooked to perfection (not mushy at all), and the gravy is rich and so delicious. 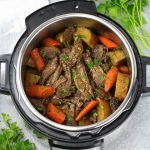 This is sure to be your new go-to Instant Pot Pot Roast Recipe! Heyyya my friend! 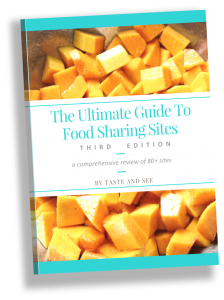 Today is a special day over here at Taste And See! 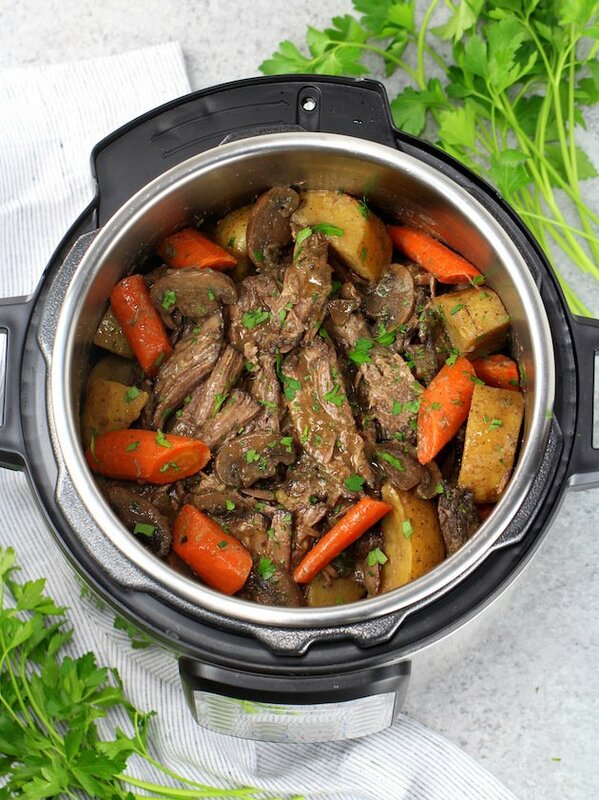 I’m excited to report I’ve mastered the Instant Pot Pot Roast and it’s a great recipe!! You may remember back a few months I was sharing my “pot roast fails” with you while introducing this absolutely mouth-watering Instant Pot Beef Thai Red Curry. I told you how my first shot at a pressure cooker pot roast came out tough and rubbery, mushy veggies? 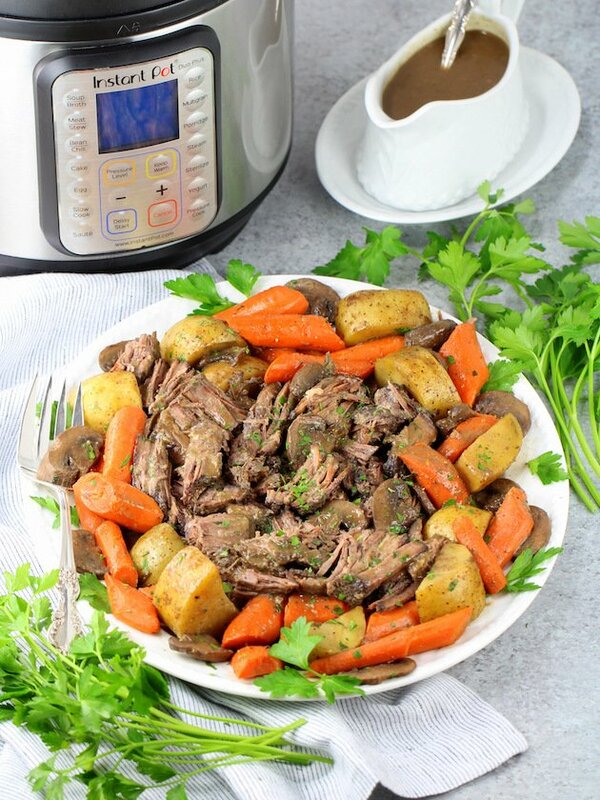 Well, I’m happy to report, after trial and error, my latest Instant Pot recipe win – Instant Pot Pot Roast with Veggies and Gravy! 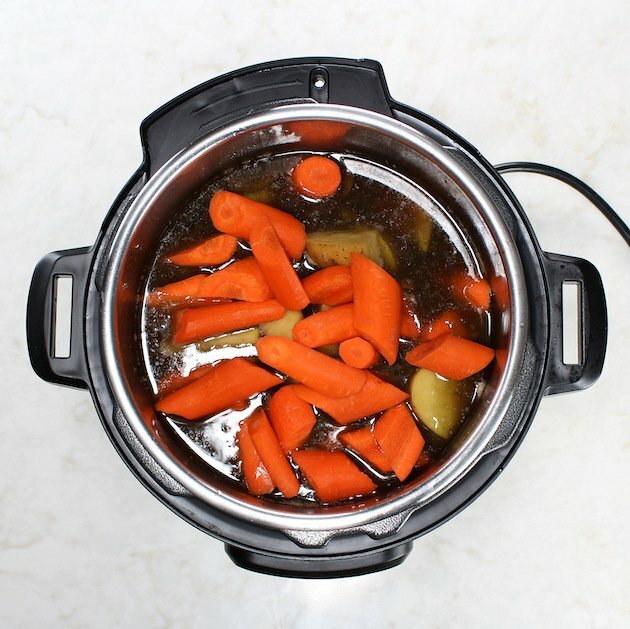 Since I know you’re on the edge of your seat with anticipation over there let me jump right into this pressure cooker roast recipe. 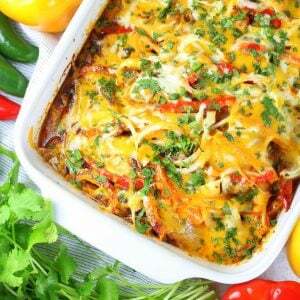 I used a 3lb beef chuck roast for this recipe. It has some nice marbling but not too much fat. I seasoned the chuck roast with 1 teaspoon salt and pepper. Next, I started browning the roast on both sides on the (high) saute mode of my DUO 6 quart IP. I like to add the oil, then let the IP get nice and hot, then add my roast. I let it brown for 5 minutes per side, then removed it, put it on a platter, and set it aside. Next, I added the onions and garlic and sauteed them for 3 minutes. I added a few tablespoons of beef stock to the pot to help remove the browned bits off the bottom of the pot. Next, I added the sliced mushrooms and let them saute for about 5 minutes, stirring once or twice. Then, I stirred in the red wine (I used a Cabernet), beef stock, Worcestershire sauce, fresh herbs, salt and pepper, and turned the saute mode off. 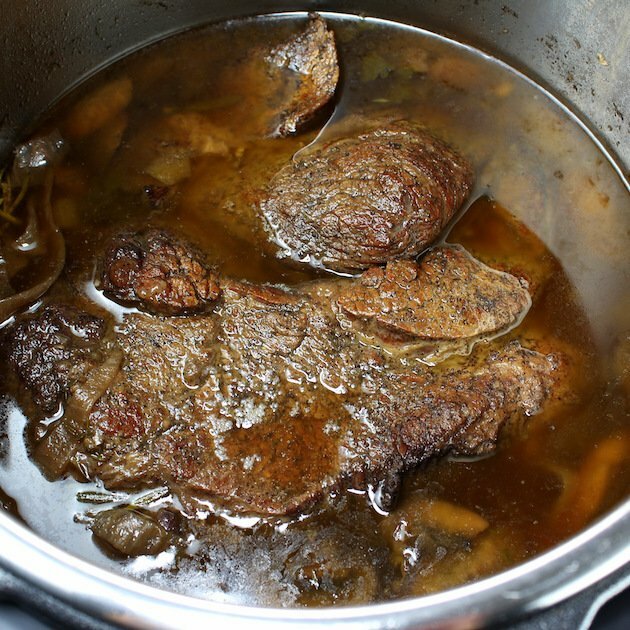 Finally, I added the roast to the pot (it was almost submerged in the liquid), locked the lid in place, and selected the meat/stew setting for 60 minutes (the general rule for pot roast is 20 minutes of pressure cooking for every pound of meat). After the pressure cook time completed, I allowed the pressure to natural release for 15 minutes. Then I turned the nozzle to “Venting” to manually release any remaining pressure. Next, I carefully unlocked and removed the lid, then gently removed the pot roast, setting it aside and covering it with tin foil. Then I did a quick release and removed the lid. I poured the rest of the liquid and veggies through a strainer and captured all the liquid in a large bowl underneath. Then I spooned my veggies and mushrooms onto a platter and tented them with foil. I poured the strained liquid back into the Instant Pot, added a mixture of cornstarch and water, and stirred it in. Then I sautéed and reduced it for 10 minutes, adjusted my seasoning and stirred in some half and half to make it a little creamy. I tasted it and adjusted my seasoning, stirred in some half and half to make it a little creamier… then declared it a delicious masterpiece! 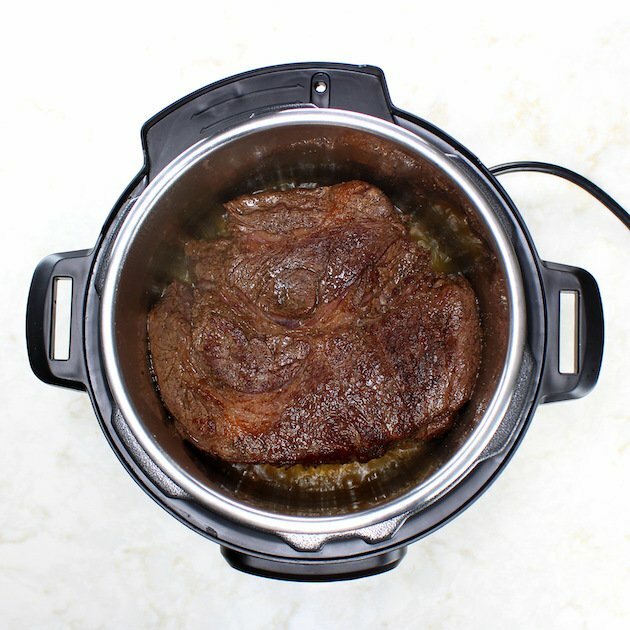 Can you cook beef roast and veggies together in an instant pot? After many variations and attempts of cooking the roast and veggies together, I decided it just wasn’t meant to be. The meat needs a much longer cook time than the veggies and I wasn’t willing to eat mushy carrots or a rubbery undercooked roast. So this was the best method I found… it produced tender meat and perfectly cooked carrots and potatoes. Plus, the veggies had some nice flavor from cooking them in the beef broth. And the gravy took on a hint of sweetness from the carrots. 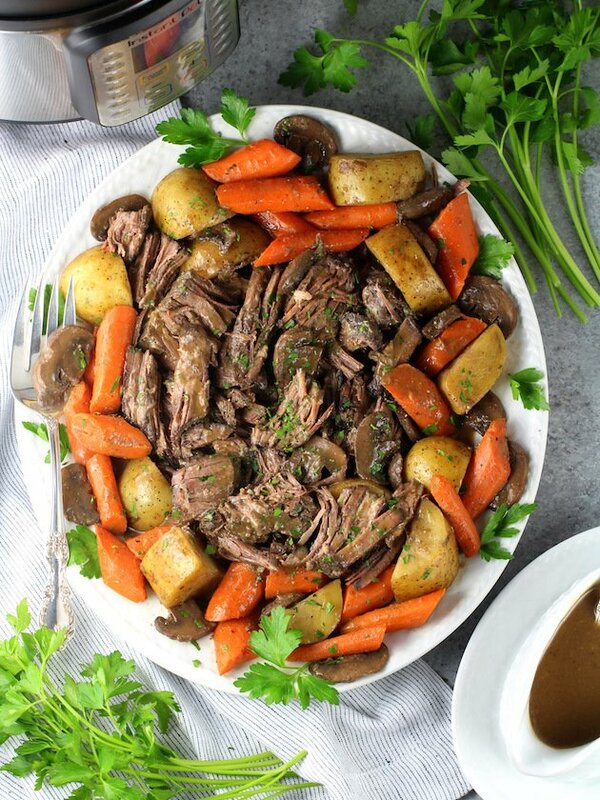 This Instant Pot Pot Roast is a delicious and comforting meal the whole family will surely love! 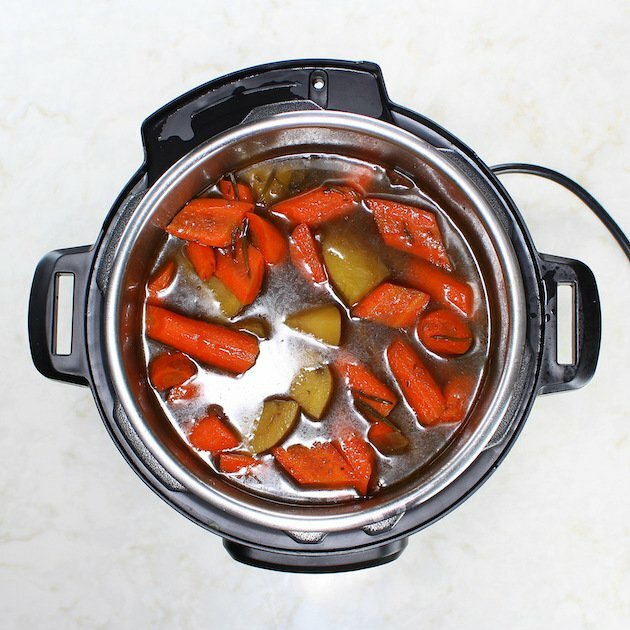 Instant Pot Pot Roast Veggies and Gravy - everything a tender, hearty, instant pot roast should be and more! Use kitchen twine to tie rosemary, thyme and parsley into bundles and set aside. Rinse roast, pat dry with a paper towel, then season the meat with 1 teaspoon salt and pepper. 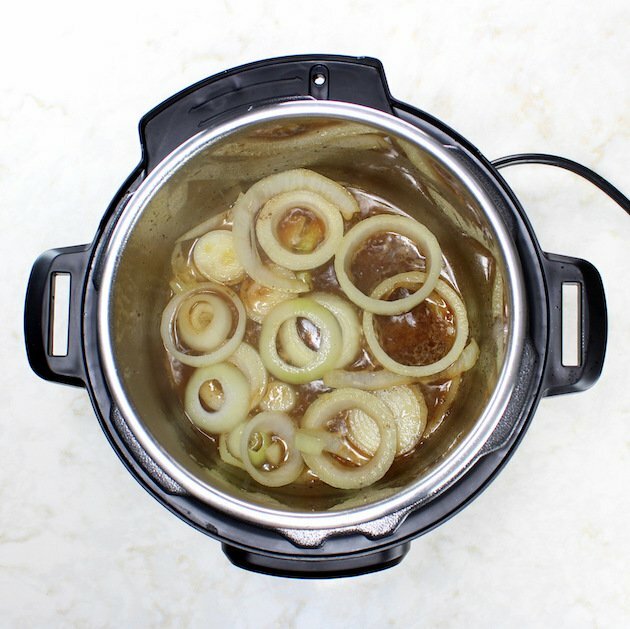 Add 1 tablespoon of olive oil into the instant pot. (I used the DUO 6 quart IP for this recipe.) Coat the entire bottom of the pot. Turn on the saute (high) mode of the IP. Add the seasoned chuck roast into the pot, then let it brown for 5 minutes on each side. Remove and set aside. Add in the sliced onions, and a few tablespoon of stock to deglaze the bottom of the pot. Cook the onions for roughly 2 minutes, using a rubber spatula scrape brown bits off the bottom of the pot. Then, add minced garlic and stir for 30 seconds until fragrant. Pour 2 more tablespoons of stock in the pot, and add in the mushrooms. Saute for 5 minutes, stirring and making sure the bottom of the pot has no brown bits. Brown bits = burn notice. 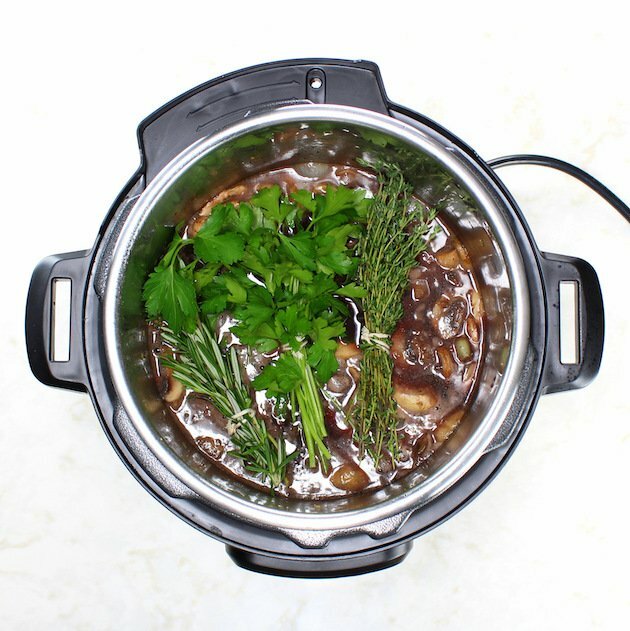 Stir beef stock, red wine, Worcestershire sauce, rosemary/thyme/parsley herb bundles, and 1 teaspoon salt and ½ teaspoon pepper into the pressure cooker. 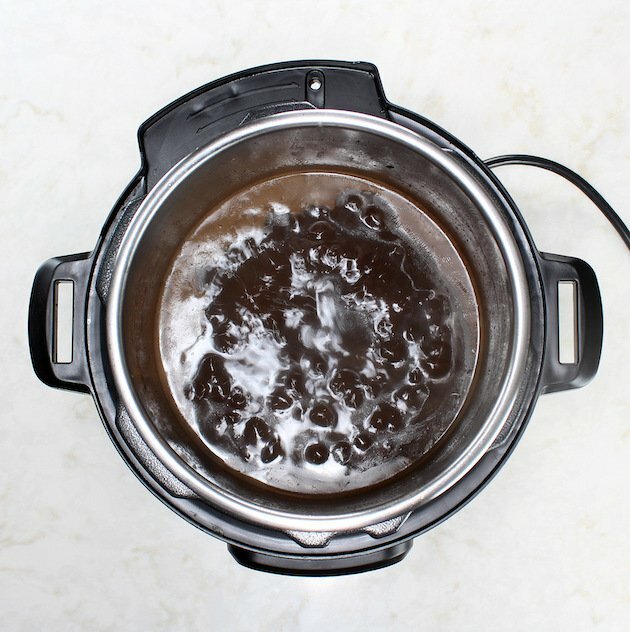 Return the chuck roast and its juices to the instant pot. Close the lid and pressure cook using the Meat/Stew button at High Pressure for 60 minutes. Allow the pot to naturally release pressure for 15 minutes, then manually release any remaining pressure by turning the valve to “Venting.” This will take about 3 minutes. Remove the chuck roast, set aside on a large plate and tent it with tin foil. Open the lid carefully. Pour the liquid and veggies from the roast through a strainer. 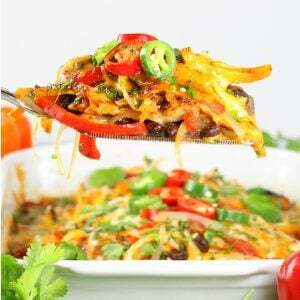 Scoop the veggies and mushrooms onto a platter and tent with tin foil. Discard the herb bundles and any other bits and pieces from the strainer. Skim the fat off the top of the liquid and pour the remaining liquid back into the pot. Mix your cornstarch water together in a small bowl and stir in the mixture the IP. Saute for 8-10 minutes until reduced by half. 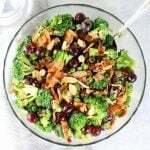 Taste the sauce and adjust the seasoning as preferred with garlic powder, onion powder, salt and pepper and even some half and half to make it creamier. Use two forks to pull the roast. Discard any fat you find. 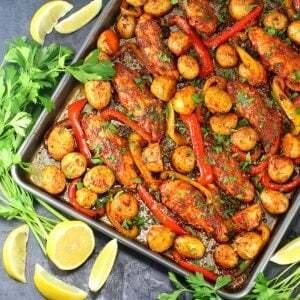 Then serve with veggies, gravy and garnish with fresh chopped parsley. 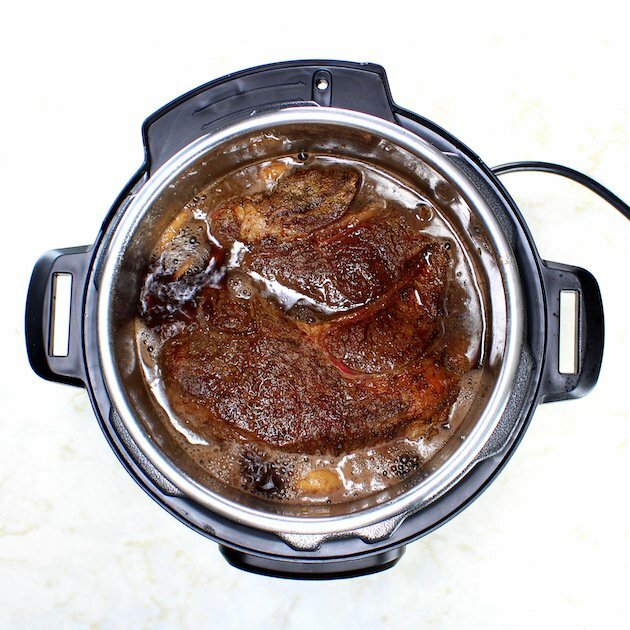 *A good rule of thumb is 20 minutes of pressure cooking per pound of chuck roast. 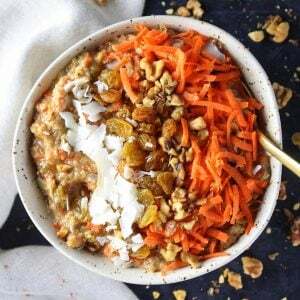 MY FAVORITE INSTANT POT RECIPES! 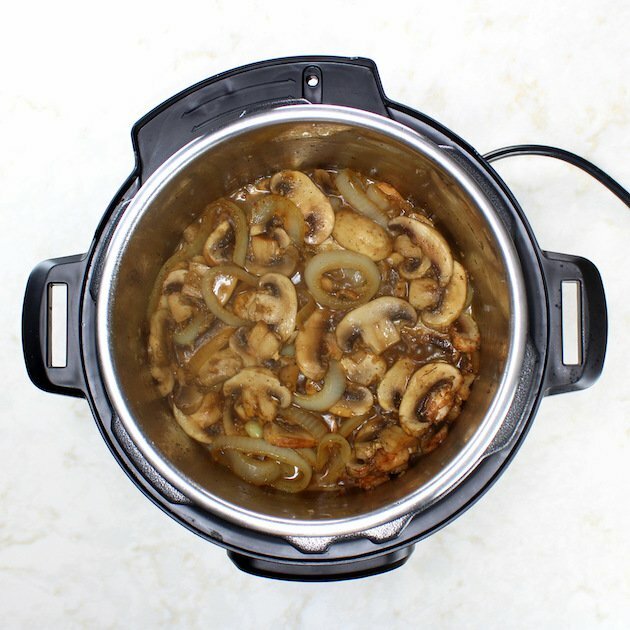 If you’re still considering your first instant pot purchase, be sure to check out my latest Instant Pot Review!! 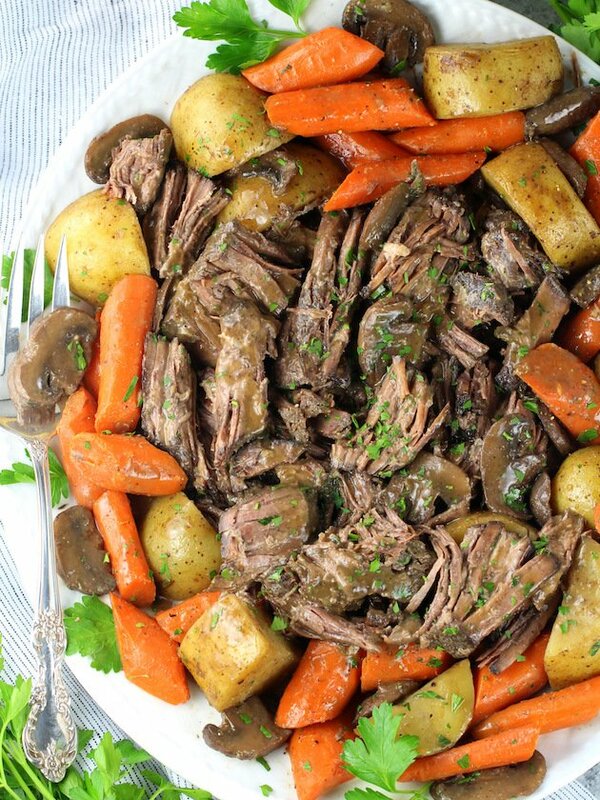 I’ve been wanting to make pot roast for a while now so this is perfect timing! 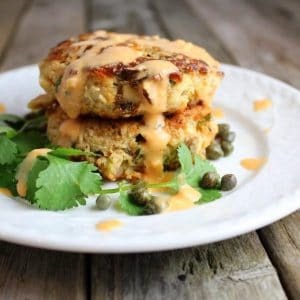 I know my whole family will cozy up to this dinner! 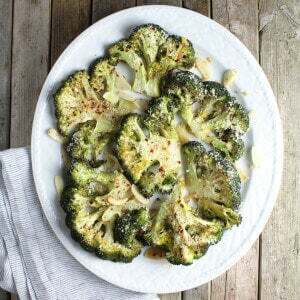 I love a tender roast, but mushy veggies are a no-go. So glad you found a way to make it all work! 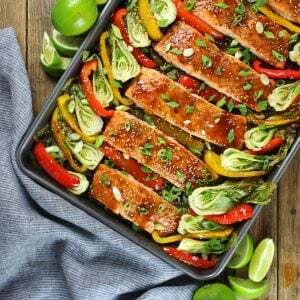 The recipe looks fantastic! I have been so scared to try roast and ruin it but I think I will try this one. How big was your roast? Mine is almost 4 pounds but really thick. I am wondering if I should cut it up before I put it in? 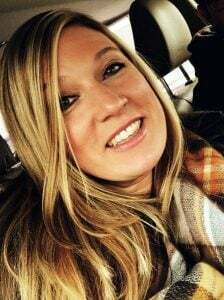 Hi Kristy, My roast was 3 pounds. You will need to cook a 4 pound roast an extra 20 minutes – so 80 minutes total. The rule of thumb is 20 minutes per pound of roast. Also, mine was 3-4 inches thick. I recommend slicing it in half if it’s really thick. And you can cut it up into 3-4 pieces for sure. It will cook quicker if it’s cut up.